This morning I went out to Bountiful Lake to help out with a clean-up that Gords had organized. I met Gords, two of his sons, Jim and Kate in the parking lot at 9:00am. After getting our garbage sacks, we split up and started picking up trash. For those who aren't familiar with Bountiful Lake, it is a small lake (more like a pond really) just west of Legacy Parkway. It's a popular place to fish, picnic, kayak, canoe, paddleboard, camp and swim. Unfortunately, with all the people that use the lake, there is a lot of trash that gets left along the shore line. There are plenty of garbage cans around the lake and in the parking lot, but a lot of trash ends up in the water and along the shore. Between the six of us, we collected about six garbage bags of trash. Most of what I picked up was plastic bottles and caps, Styrofoam (I think from coolers), food packaging and fishing related trash (fishing line, etc). Kate was the real star of the day. She had on waders and spent most of the time in the chilly water along the shore. I am glad that Gords puts together these clean-up days and wish that more individuals and groups that use Bountiful Lake would take the time to clean it up as well. 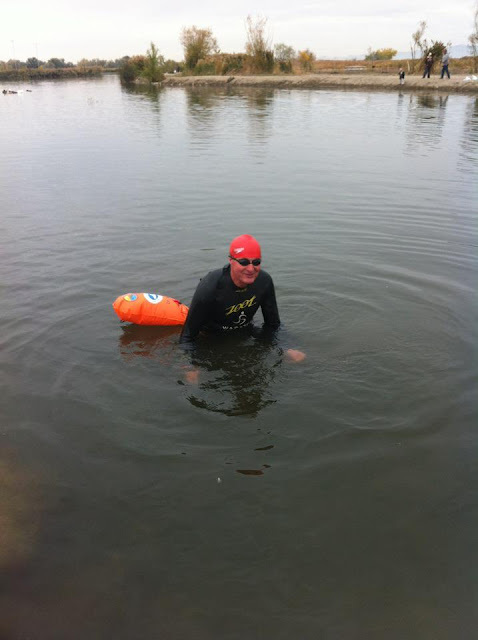 After about two hours of cleaning up, Jim and I decided we might as well get in the water and swim. He put on his wetsuit and I changed into my suit and we headed down to the water. Depending on who you ask and who's thermometer you trust, the water was between 50 and 51 degrees! A full six degrees colder from earlier this week! I had hoped that we were going to ease into colder temperatures as we went through the fall and winter months, but it looks like we aren't going to have that luxury. We were swimming in water colder than this earlier in the year, but I wasn't sure how I would react to such a sharp temperature drop. We decided to start at the boat ramp (since we had just cleaned up all the trash around it) and swim out to the fishing dock and back. Jim got in first and I went in second. 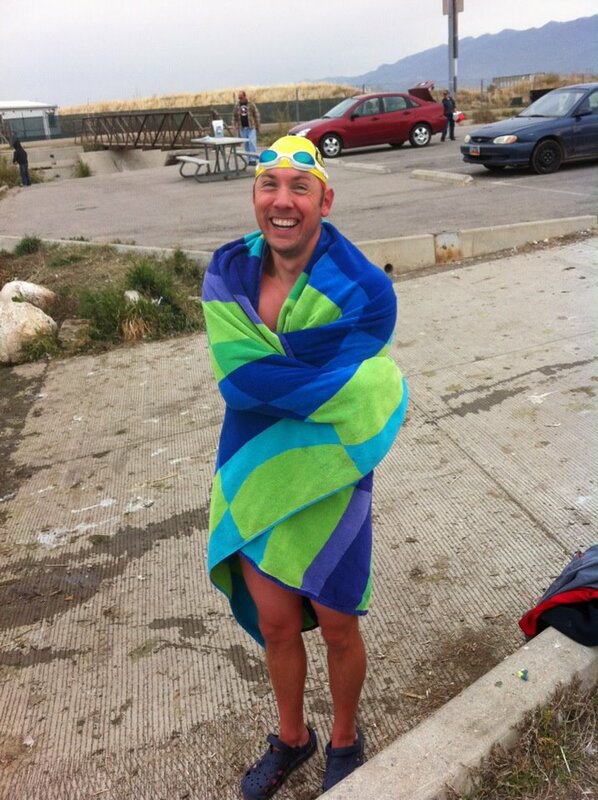 I was shocked at how cold the water felt. It stung and I had a hard time getting my breathing under control. Despite the cold, I was able to keep my face in the water. About 3/4 of the way to the dock I had second thoughts and wondered if I should turn around. Instead, I decided to keep going and made it to the dock. I immediately turned around and headed back to the boat ramp. When I got out my skin was bright red, but I warmed up quickly and only had minimal shaking. Jim also seemed to be fine, but mentioned that he was going to stop at Wasatch Running on his way home and get a neoprene cap. Kate stuck around to see us swim and took some photos (thanks Kate!). I am a little worried that it is going to get too cold, too fast for us to keep going for very long. We will see how things go, but I am still planning on at least "plunging" once a week through the winter.